This article was first published in my Eat the Season column in the Wells Journal on 16 January 2014. I am rather partial to a big bowl of minestrone. 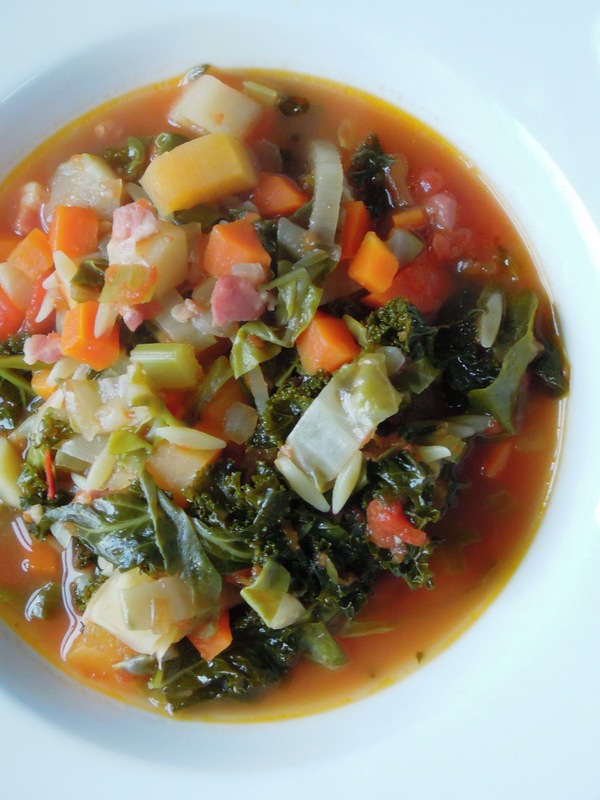 It’s such a versatile soup and lends itself brilliantly to whatever vegetables are in season. During the summer months I like to make minestrone using produce straight from our small veg patch – ingredients like peas, beans, asparagus and lots of lovely fresh herbs, such as basil, oregano or mint. It makes for a wonderfully light and crunchy dish, especially when you serve with a spoonful of pesto on top. And there’s something rather virtuous and wholesome about cooking up a pot of soup from things you’ve grown yourself. I come over all Barbara from The Good Life. But winter minestrone is quite a different affair; much more comforting and satisfying. It transforms what can seem quite dreary winter vegetables into a fine meal, and succeeds in persuading my youngest daughter to actually enjoy leafy greens. Everyone tends to have their own way of making minestrone. Some add rice or pasta, others don’t. Common ingredients usually include beans, onion, celery, carrot and tomato. Minestrone of course hails originally from Italy. Almost every Italian region has its own version, which varies from a thick, mushy soup to something more like a broth with lightly cooked vegetables and sometimes meat too, such as sausage or bacon. 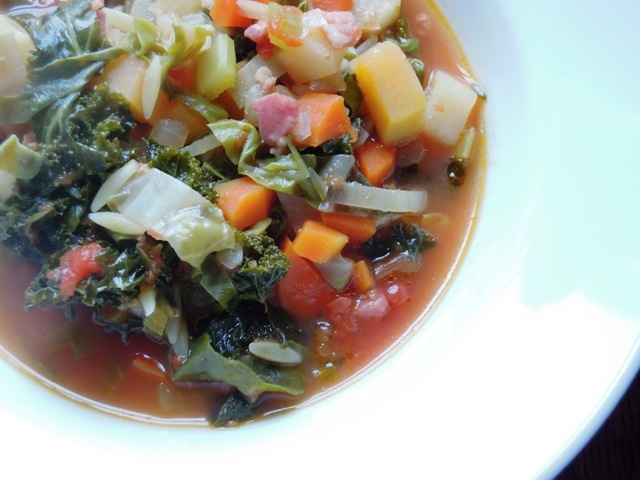 This is my recipe for winter minestrone, featuring pancetta for a rich, smoky flavour. I’ve also used the tiny, rice-shaped pasta, orzo, but feel free to substitute with rice or any other small pasta or even broken spaghetti. Heat the olive oil in a large saucepan and slowly fry the pancetta, onion, carrot and celery until soft. Add the garlic and root vegetables and continue to cook while stirring to prevent sticking. Stir in the chopped tomatoes and cook for about 5 minutes until they have reduced a little. Add the winter greens, thyme and the hot stock, and bring to the boil. Simmer gently for 20 minutes. Add the orzo and cook for another 10 minutes or so until the pasta is tender. Season to taste. Serve hot with freshly grated Parmesan. As the soup is packed full of healthy vegetables, I’m entering it into January’s Four Seasons Food challenge, hosted by Eat Your Veg and Delicieux, where the theme this month is Virtuous Food. I reckon you can eat a bowlful of this minestrone and feel very virtuous indeed! The soup looks amazing, it’s just the sort of food I enjoy. It’s definitely on my list of things to make. Thanks Julie – let me know what you think if you make it! I’ve just made something similar. I add a Parmesan rind in with the stock as I don’t use pancetta (so veggie daughter can eat it). Best kind of comfort food. What a great use of flavours. This one’s been bookmarked! I’m loving the pancetta addition. I made a veggie version a few weeks ago and whilst it was delish was missing a little flavour oomph that I’m sure this one has. I agree Minestrone is a fab way of getting kids to enjoy green leafy veg, mine don’t bat an eyelid in soup or a stew but if they were just placed on their plate would recoil in horror! Fabulous entry to Four Seasons Food, certainly ‘Virtuous’.